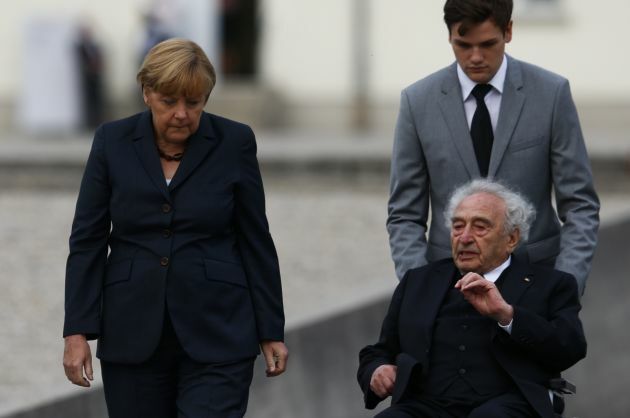 (Photo: REUTERS / Michael Dalder)German Chancellor Angela Merkel speaks with Max Mannheimer, a Holocaust survivor, after a wreath laying ceremony at the former concentration camp in Dachau near Munich August 20, 2013. Angela Merkel paused in her campaign for a third term to lay a wreath at Dachau concentration camp on Tuesday, making her the first German chancellor to visit the Nazis' first death camp where they killed more than 41,000 people in the Holocaust. DACHAU, Germany (Reuters) - Angela Merkel has laid a wreath at Dachau concentration camp, making her the first German chancellor to visit the death camp where Nazis killed more than 41,000 people in the Holocaust. Taking a pause in her campaign for a third term in office, the chancellor on August 20 met survivors, including Abba Naor, an 85-year-old Jew whose mother and 5-year-old brother were murdered in concentration camps along with dozens more relatives.